We can’t begin without talking about his Number One Strat, which Stevie claimed to be a ’59, since that was the date stamped on the back of the pickups… this was incorrect, however, as guitar tech Rene Martinez (who oversaw SRV’s guitars since 1980) found the stamp of 1963 on the body and 1962 on the original neck (the neck was replaced in 1989 after it could no longer be refretted properly; Rene used the neck from another SRV favorite, “Red”, as it was also a 1962 model). The pickups are also relatively low output, not the hot overwound myth that gained legs during the 80s… all 3 pickups are rumored to be under 6k ohms output impedance, which would be typical of a 1959 set (the neck pickups tended to be hottest, but not by much). 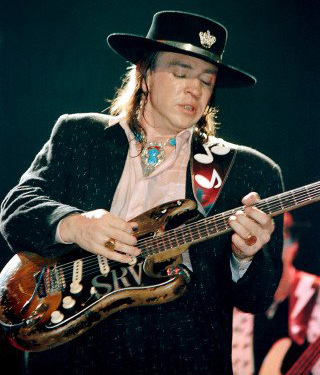 Although the Fender SRV signature model uses Texas Special pickups, which Stevie was heavily involved in the making of, they do not accurately represent the sound of his original Number One (For my money, I use a set of Arcane ’61 Experience pickups in my main strat, and they sound incredible, especially in the neck/middle combined position). As for strings, SRV used 13’s, as famously rumored, but it was a custom set with an unwound 3rd string… exact gauges, according to Rene Martinez, were .013, .015, .019p, .028, .038, and .058. Stevie had large, incredibly strong hands, but even he couldn’t bend a wound G-string up a full step for an entire night. Also, as he tuned down to Eb, the tension on the strings was closer to that of 12s, but with increased thickness. 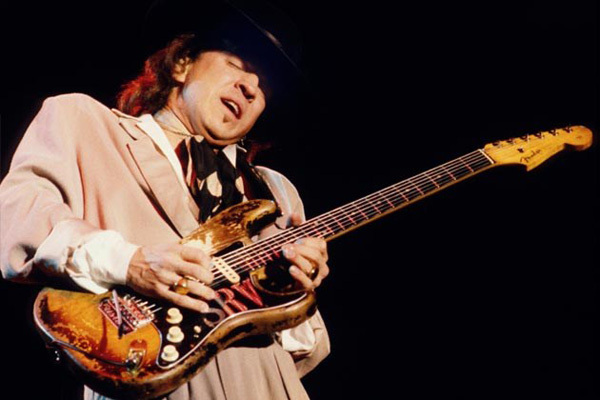 There is much debate as to the tonal difference with string gauge… I’ve found the biggest noticeable difference when using higher gain amps, as thicker strings retain their clarity a bit more than thinner, and as SRV loved big, clean tones (more when we get into his amps), I imagine this influenced his choice, but perhaps not more than the feel & his playing style… his percussive right hand strumming was acoustic-like, and light strings wouldn’t be able to take that kind of punishment for long. Late in his career, he did go down a bit lighter to 11s (although it’s total speculation, I’ve gotta believe this had something to do with his getting sober… nerves become a lot more sensitive when you’re not dulling them constantly, and his fingertips took a beating from those 13s). Although Stevie had several other great guitars in his arsenal, Number One was like an extension of his body & soul, and the others were just variations on the model he played primarily. I’d instead prefer to focus on SRV’s numerous and ever-changing array of amplifiers (I’ll be using a bit of info from this excellent Guitar World article, but have gone even further in depth). From the start, while cutting his teeth at clubs like Antone’s on 6th street in Austin, it was a pair of 1964 Fender Vibroverbs that anchored the SRV tone, along with an Ibanez Tubescreamer to push them into overdrive. These two amps were both 15” combos (as opposed to the earlier ’63 models with 2x10” speakers), and powered by dual 6L6 power tubes for 40 watts of power each (Fun fact: although the amps were purchased years apart in different states, the serial numbers are one digit apart). Cesar Diaz would eventually mod these Vibroverbs with solid state rectifiers to increase the available headroom and squeeze a few more watts of juice out of them. 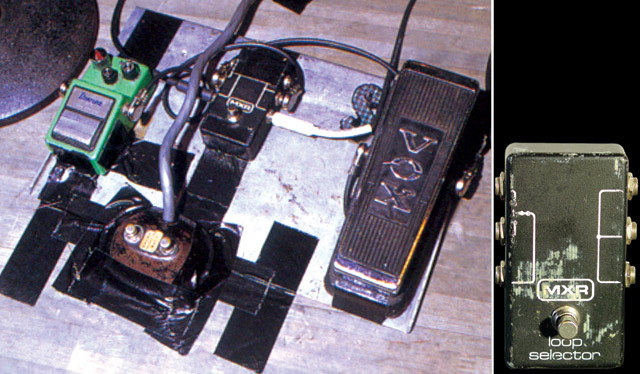 In fact, Cesar mod’d just about all of SRV’s amps with a solid state rectifier, to prevent harmful voltages from damaging the tubes at such high volumes, and also because Stevie preferred the extra headroom and quicker response feel (Fender even made a special hand-wired '64 Vibroverb reissue with the Diaz mods, including a switchable rectifier circuit and ability to cascade one channel into the other. It is now discontinued). Transformers were also swapped out for the beefier hunks of iron found in Twins & Bassmans, as they held up much better at high levels than the original units. 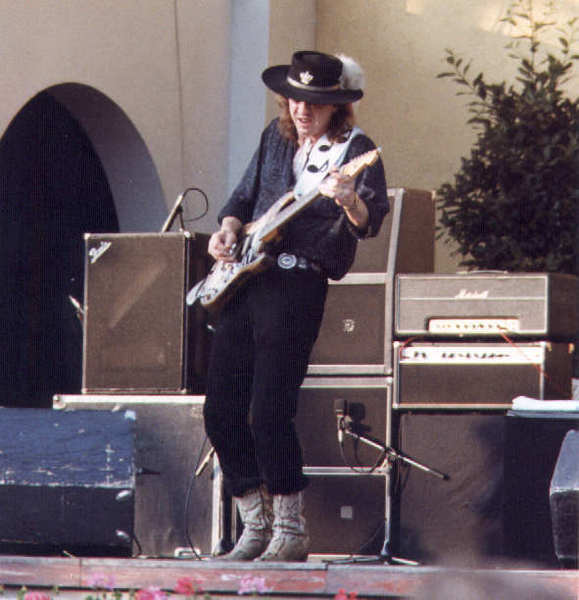 SRV initially used JBL D130 alnico speakers in these combos, then E130 ceramics, but eventually switched to ElectroVoice M15Ls (and stuck with EVs for the rest of his career, for both their power handling and high sensitivity before breakup). One of these combos was also used to drive his Fender Vibratone rotating speaker cabinet for live performances of “Cold Shot” and “Couldn’t Stand the Weather” later on. 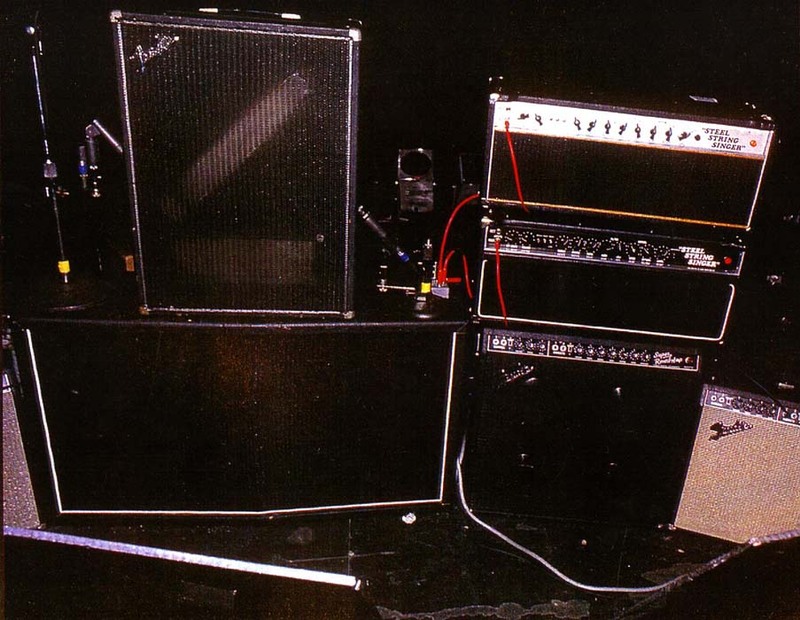 SRV's Vibroverb (center) flanked by what look to be a pair of Mesa/Boogie combos, as he had mentioned using briefly around the David Bowie era. As Stevie’s popularity grew, so did the size of venues and need for more power. Stevie would add a Marshall Club & Country combo (Marshall's answer to the Fender Twin, a 100-watt 2x12 with KT77 tubes & Celestion G12-80 speakers) to his Vibroverbs for more clean power, as well as experiment with blackface Fender Twins and Mesa/Boogie combos (likely Mark IIc+ models, used with David Bowie). This was the beginning of the quest for the ultimate LOUD yet clean tone, retaining clarity and detail along with the beautiful harmonic enrichment of cranked power tubes, and would be a lifelong venture. He also added a pair of Fender Super Reverb 4x10” combos to the stage, essentially the same amplifier as the Vibroverb but providing some variance in tone due to the different speaker array. With all four 10" speakers replaced with EVs, each combo weighed nearly 130 pounds and could take your head off with bite. The Super Reverbs even replaced the Vibroverbs altogether at one point in the mid-80s ever-changing amplifier landscape. The Texas Flood Dumbleland Special, once owned by Jackson Browne, shown here being used in a recording session by John Mayer (recently sold for $160,000 to a private collector). 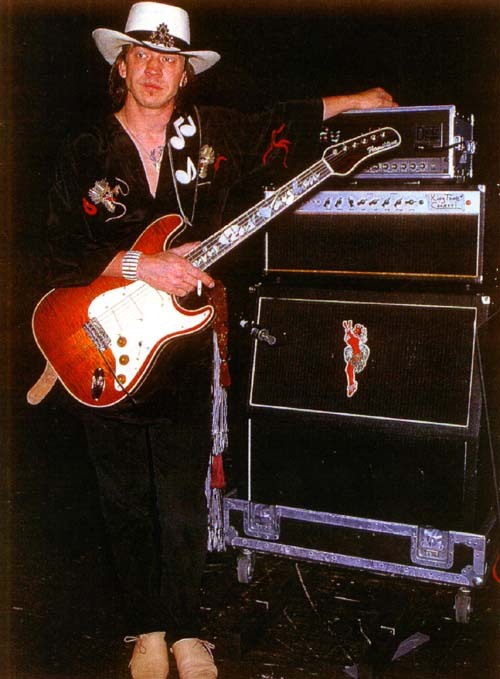 SRV with his Dumble SSS "King Tone Consoul" and custom Hamiltone strat, a gift from Billy Gibbons. 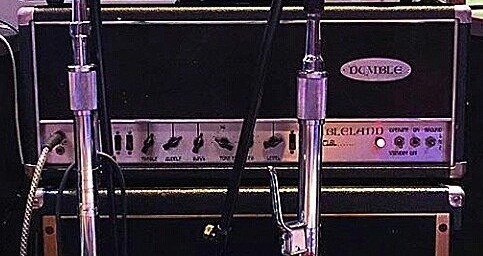 At Jackson Browne's Downtown Studios, SRV would encounter the Dumbleland Special amplifier head, originally built for and owned by Browne. 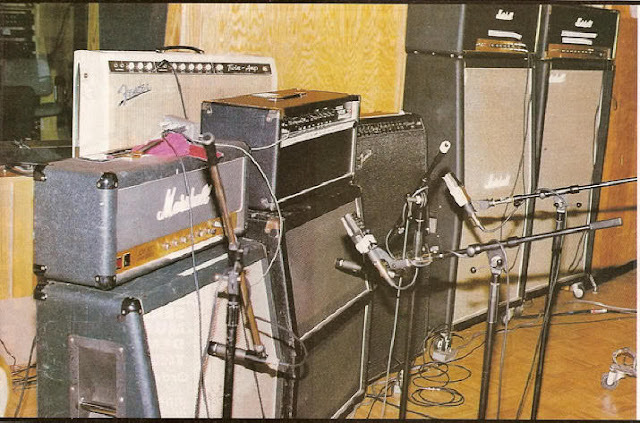 There’s some debate as to whether this amp was a monster 300-watt model designed for bass, or the more conventional 150w head using 6550 tubes (which SRV’s eventual custom model would utilize), but either way, Stevie loved it, and used it along with his beloved Vibroverbs for the recording of his debut album (This amp was most recently owned & used by John Mayer for a brief period, before selling it to a collector). He would then contact Alexander Dumble and order his own custom amp, a Steel String Singer model, voiced to his personal specs and used on his next album, Couldn’t Stand the Weather (which, in my opinion, contained his best guitar tones ever recorded). 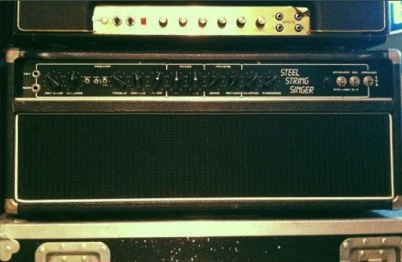 This amp would be dubbed “King Tone Consoul”, and regarded along with Number One as Stevie’s most prized and important pieces of gear (another similar Dumble would be built and added as a backup, with a third model ordered but never delivered due to a rumored dispute between Dumble & SRV, more on this later). After some speaker experimentation, a 4x12 loaded with EV M12Ls became the mainstay. The quest for a bold, beautiful clean tone was complete, and now it was time for some Hendrix-inspired color. on display at the Grammy museum. Fender Vibratone cab (upper left), on top of what looks like a Marshall 8x10" cab, two Dumble heads on top of a Super Reverb (being used as a speaker cab), and a Vibroverb (far right). Vibratone (left), a stack of 4x12s, and Marshall Major on top of Dumble head (right). As a lifelong Jimi devotee, Stevie began paying tribute to him both on album and in concert, and added a 200-watt Marshall Major lead head to the arsenal, at one point even ditching all of the Fenders and running just the Marshall & Dumble for a bit (You can see & hear this duo in the interview video below). Blowing tubes on this amp was an almost nightly occurrence, according to amp tech Cesar Diaz, as Stevie would walk over and crank it up to 10 for the encore “Voodoo Child” at the end of the set. He was also occasionally seen using Marshall Super Leads and even JCM 800s in the late 80s, but these flirtations rarely lasted long. In addition to the Marshall, Stevie began experimenting with Dallas-Arbiter germanium Fuzzfaces, but inconsistency in the original units led Cesar to build a custom fuzz pedal for Stevie with matched germanium transistors, known as the Diaz Square Face fuzz. Stevie also incorporated an Octavia octave fuzz and original UniVibe pedal for his Hendrix tributes, along with Vox wah pedals. He famously linked two wahs together for the tune “Say What!”, and also ran a pair of Tubescreamers together at times, one set for the more traditional boost, the other with the gain higher (These pedals would feed into all of the amps simultaneously). 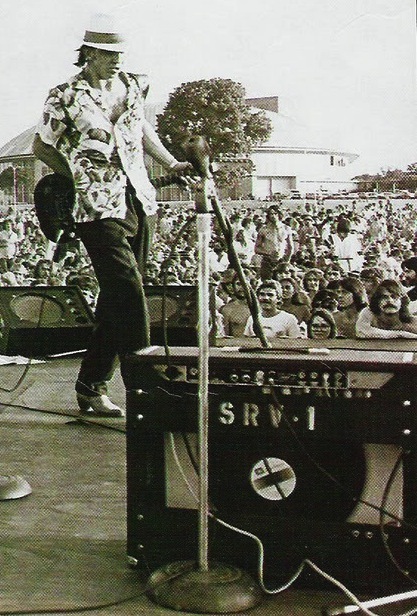 During the recording of In Step, SRV had as many as 32 amps at his disposal, running up to 10 simultaneously, including a couple of reissue ’59 Bassman heads. There’s a great article with producer Jim Gaines on the making of this album for more info. Studio shot from the In Step sessions, L-R: Marshall JCM 800, Blonde Fender Twin, Dumble Steel String Singer, Fender Super Reverb, Marshall Majors on 8x10" & 4x15" cabs. Shortly before his death, and likely influenced by Eric Clapton (whom used Soldanos heavily in the late 80s), Stevie began talking to amp builder Mike Soldano about a custom amp that could deliver the kind of tone he loved from his cranked amps but at a lower volume, and without any pedals… they started work on a custom model, but it wouldn’t be completed until after Stevie’s untimely death (See the below feature from Guitar World for more on this amp). It is rumored that Alexander Dumble wasn’t happy with Stevie’s flirting with another amp designer, which caused the delay and ultimate non-delivery of his third Steel String Singer (it’s also rumored that Dumble doubled the cost at the last minute, but none of this has been substantiated). 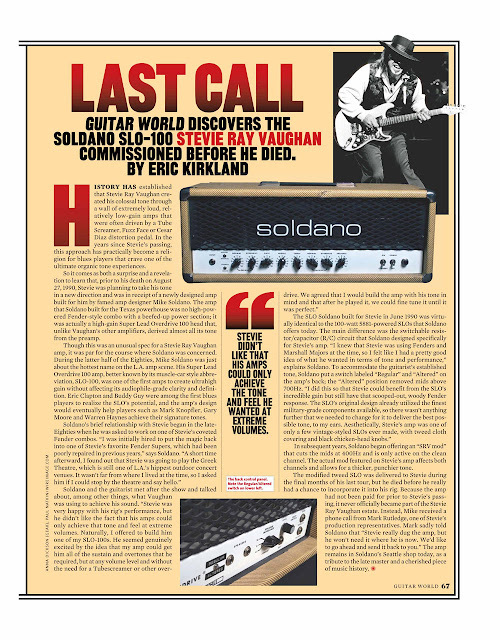 This means that in addition to the Soldano, there is another custom-made SRV amp in existence, and unfortunately the world never got to hear it. It's my understanding that Jimmie Vaughan owns most of the classic pieces, including Number One, the Vibroverbs, and his main Dumble Steel String Singer. The two boogie looking amps flanking the Vibroverb, in the picture with the Strat on the floor, are (At least the one on the left, and most likely also the one on right too), are Studiomaster Valve Leadmaster´s. It is an English made amp from the early 80´s. No doubt heavily inspired by boogie. As far as I recall they were VERY expensive, which no doubt is one of the reasons they vanished from the market pretty quickly.